American psychologist and philosopher who has been called 'Father of American Psychology' but later in life pursued philosophy, became one of founders of pragmatism, and wrote seminal works including The Meaning of Truth (1909). 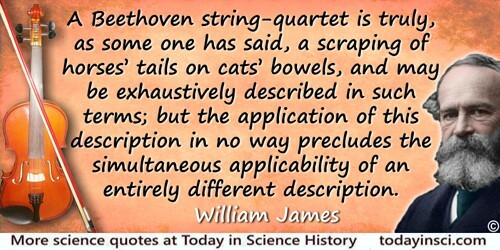 A Beethoven string-quartet is truly, as some one has said, a scraping of horses’ tails on cats’ bowels, and may be exhaustively described in such terms; but the application of this description in no way precludes the simultaneous applicability of an entirely different description. In The Sentiment of Rationality (1882, 1907), 76. All our scientific and philosophic ideals are altars to unknown gods. 'The Dilemma of Determinism' (1884). In The Will to Believe and Other Essays in Popular Philosophy (1897), 147. From Essay, 'German Pessimism', a book review (of Der Modern Pessimismus by Edmund Pfleiderer) in Nation (7 Oct 1875), 21, No. 536, 233. Reprinted in Ralph Barton Perry (ed. ), Collected Essays and Reviews by William James (1920), 17. Consciousness… does not appear to itself chopped up in bits. Such words as “chain” or “train” do not describe it fitly as it presents itself in the first instance. It is nothing jointed; it flows. A “river” or a “stream” are the metaphors by which it is most naturally described. In talking of it hereafter, let us call it the stream of thought, of consciousness, or of subjective life. Source of the expression “stream of consciousness”. The Principles of Psychology (1890), Vol. 1, 239. Every perception is an acquired perception. In 'The Perception of “Things”', The Principles of Psychology (1890), Vol. 2, 78. First... a new theory is attacked as absurd; then it is admitted to be true, but obvious and insignificant; finally it is seen to be so important that its adversaries claim that they themselves discovered it. 'Pragmatism's Conception of Truth', in Pragmatism: A New Name for some Old Ways of Thinking, Popular Lectures on Philosophy (1907), 198. For this we must make automatic and habitual, as early as possible, as many useful actions as we can, and guard against the growing into ways that are likely to be disadvantageous to us, as we should guard against the plague? 'The Laws of Habit', The Popular Science Monthly (Feb 1887), 434. I have to forge every sentence in the teeth of irreducible and stubborn facts. Letter to his brother Henry James, while William was writing his Principles of Psychology. As quoted in 'The Origins of Modern Science', Science and the Modern World (1926, 2011), 3. In practical talk, a man’s common sense means his good judgement, his freedom from eccentricity, his gumption. In Lecture (1907/1908), 'Pragmatism and Common Sense', collected in 'Lecture 5: Pragmatism and Common Sense', Pragmatism: A New Name for Some Old Ways of Thinking (1907, 1910), 171. Man, biologically considered, and whatever else he may be into the bargain, is simply the most formidable of all the beasts of prey, and, indeed, the only one that preys systematically on its own species. From 'Remarks at The Peace Banquet' (7 Oct 1904), Boston, on the closing day of the World’s Peace Congress. Printed in Atlantic Monthly (Dec 1904), 845-846. Collected in Essays in Religion and Morality (1982), Vol. 9, 121. Nature in her unfathomable designs had mixed us of clay and flame, of brain and mind, that the two things hang indubitably together and determine each other’s being but how or why, no mortal may ever know. Principles of Psychology (1918), 200. 'The Will to Believe' (1896). In The Will to Believe and Other Essays in Popular Philosophy (1897), 14. Our natural way of thinking about these coarser emotions is that the mental perception of some fact excites the mental affection called the emotion, and that this latter state of mind gives rise to the bodily expression. My theory, on the contrary, is that the bodily changes follow directly the perception of the exciting fact, and that our feeling of the same changes as they occur IS the emotion. Common-sense says, we lose our fortune, are sorry and weep; we meet a bear, are frightened and run; we are insulted by a rival, are angry and strike. The hypothesis here to be defended says that this order of sequence is incorrect, that the one mental state is not immediately induced by the other, that the bodily manifestations must first be interposed between, and that the more rational statement is that we feel sorry because we cry, angry because we strike, afraid because we tremble, and not that we cry, strike, or tremble, because we are sorry, angry, or fearful, as the case may be. Without the bodily states following on the perception, the latter would be purely cognitive in form, pale, colorless, destitute of emotional warmth. We might then see the bear, and judge it best to run, receive the insult and deem it right to strike, but we should not actually feel afraid or angry. The Principles or Psychology (1890), Vol. 2, 449-50. Our science is a drop, our ignorance a sea. Whatever else be certain, this at least is certain—that the world of our present natural knowledge is enveloped in a larger world of some sort of whose residual properties we at present can frame no positive idea. In Address to Harvard Young Men’s Christian Association, 'Is Life Worth Living? ', collected in The Will to Believe and other Essays in Popular Philosophy, (1897, 2006), 54. Published earlier in International Journal of Ethics (Oct 1895). Plasticity, then, in the wide sense of the word, means the possession of a structure weak enough to yield to an influence, but strong enough not to yield all at once. Each relatively stable phase of equilibrium in such a structure is marked by what we may call a new set of habits. Organic matter, especially nervous tissue, seems endowed with a very extraordinary degree of plasticity of this sort ; so that we may without hesitation lay down as our first proposition the following, that the phenomena of habit in living beings are due to plasticity of the organic materials of which their bodies are composed. Science as such assuredly has no authority, for she can only say what is, not what is not. 'Is Life Worth Living?' (1895). In The Will to Believe and Other Essays in Popular Philosophy (1897), 56. Science, like life, feeds on its own decay. New facts burst old rules; then newly divined conceptions bind old and new together into a reconciling law. In The Principles of Psychology (1918), Vol. 2, 369. The first thing the intellect does with an object is to class it along with something else. But any object that is infinitely important to us and awakens our devotion feels to us also as if it must be sui generis and unique. Probably a crab would be filled with a sense of personal outrage if it could hear us class it without ado or apology as a crustacean, and thus dispose of it. 'I am no such thing,' it would say; 'I am MYSELF, MYSELF alone. The Varieties of Religious Experience: A Study in Human Nature (1902), 9. The God whom science recognizes must be a God of universal laws exclusively, a God who does a wholesale, not a retail business. He cannot accommodate his processes to the convenience of individuals. The Varieties of Religious Experience: A Study in Human Nature (1902), 493-5. The history of philosophy is to a great extent that of a certain clash of human temperaments… I will write these traits down in two columns. I think you will practically recognize the two types of mental make-up that I mean if I head the columns by the titles “tender-minded” and “tough-minded” respectively. THE TENDER-MINDED. Rationalistic (going by “principles”), Intellectualistic, Idealistic, Optimistic, Religious, Free-willist, Monistic, Dogmatical. THE TOUGH-MINDED. Empiricist (going by “facts”), Sensationalistic, Materialistic, Pessimistic, Irreligious, Fatalistic, Pluralistic, Sceptical. 'The Present Dilemma in Philosophy', in Pragmatism: A New Way for Some Old Ways of Thinking, Popular Lectures on Philosophy (1907), 6, 12. The self-same atoms which, chaotically dispersed, made the nebula, now, jammed and temporarily caught in peculiar positions, form our brains; and the “evolution” of brains, if understood, would be simply the account of how the atoms came to be so caught and jammed. Principles of Psychology (1918), 146. The traditional psychology talks like one who should say a river consists of nothing but pailsful, spoonsful, quartpotsful, barrelsful, and other moulded forms of water. Even were the pails and the pots all actually standing in the stream, still between them the free water would continue to flow. It is just this free water of consciousness that psychologists resolutely overlook. Every definite image in the mind is steeped and dyed in the free water that flows round it. With it goes the sense of its relations, near and remote, the dying echo of whence it came to us, the dawning sense of whither it is to lead. 'On Some Omissions of Introspective Psychology', Mind (1884), 9, 16. From review by James on W.K. Clifford, Lectures and Essays in The Nation (1879), 29, No. 749, 312. In Collected Essays and Reviews (1920), 138. There can be no final truth in ethics any more than in physics, until the last man has had his experience and his say. In 'The Moral Philosopher and the Moral Life,' The Will to Believe and Other Essays in Popular Philosophy (1910). We are once for all adapted to the military status. A millennium of peace would not breed the fighting disposition out of our bone and marrow, and a function so ingrained and vital will never consent to die without resistance, and will always find impassioned apologists and idealizers. ‘Be not afraid of life. Believe that life is worth living, and your belief will help create the fact. “Facts” are the bounds of human knowledge, set for it, not by it. 'On Some Hegelisms' (1882). In The Will to Believe and Other Essays in Popular Philosophy (1897), 271. 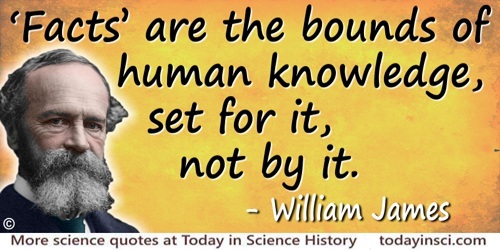 11 Jan - short biography, births, deaths and events on date of James's birth.